"A few scientists once seriously argued (or secretly hoped) that Jupiter's immense mass could produce ... a huge [diamond]. Some still hold out hope that liquid diamonds and Cadillac-sized solid ones are possible. And if you're looking for truly exotic materials, astronomers believe that Jupiter's erratic magnetic field can be explained only by oceans of black, liq­uid 'metallic hydrogen.' Scientists have seen metallic hydro­gen on earth only for nanoseconds under the most exhaustively extreme conditions they can produce. Yet many are convinced that Jupiter has dammed up a reservoir of it twenty-seven thou­sand miles thick. "The reason elements live such strange lives inside Jupiter (and to a lesser extent inside Saturn, the next-largest planet) is that Jupiter is a 'tweener: not a large planet so much as a failed star. Had Jupiter sucked up about ten times more detritus dur­ing its formation, it might have graduated to a brown dwarf, a star with just enough brute mass to fuse some atoms together and give off low-watt, brownish light. Our solar system would have contained two stars, a binary system. (As we'll see, this isn't so crazy.) Jupiter instead cooled down below the threshold for fusion, but it maintained enough heat and mass and pressure to cram atoms very close together, to the point they stop behaving like the atoms we recognize on earth. Inside Jupiter, they enter a limbo of possibility between chemical and nuclear reactions, where planet-sized diamonds and oily hydrogen metal seem plausible. "The weather on Jupiter's surface plays similar tricks with elements. This shouldn't be surprising on a planet that can support the giant red eye -- a hurricane three times wider than the earth that hasn't dissipated after centuries of furious storming. The meteorology deep inside Jupiter is possibly even more spectacular. Because the stellar wind blew only the light­est, most common elements as far out as Jupiter, it should have the same basic elemental composition as real stars -- 90 percent hydrogen, 10 percent helium, and predictable traces of other elements, including neon. But recent satellite observations showed that a quarter of the helium is missing from the outer atmosphere, as is 90 percent of the neon. Not coincidentally, there is an abundance of those elements deeper down. Some­thing apparently had pumped helium and neon from one spot to the other, and scientists soon realized a weather map could tell them what. "In a real star, all the mini-nuclear booms in the core counterbalance the constant inward tug of gravity. In Jupiter, because it lacks a nuclear furnace, little can stop the heavier helium or neon in the outer, gaseous layers from falling inward. 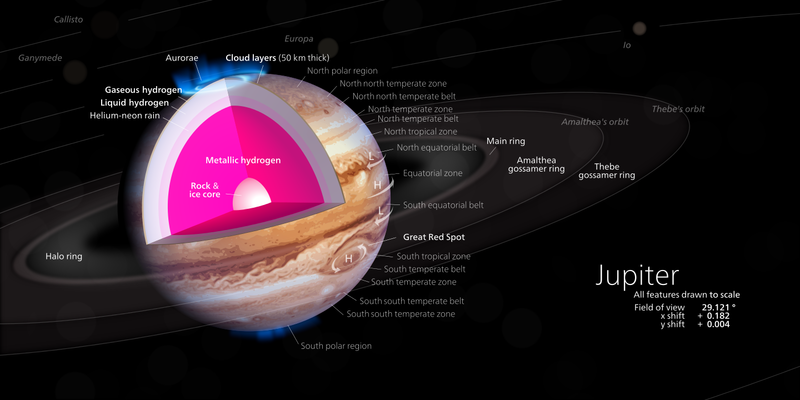 About a quarter of the way into Jupiter, those gases draw close to the liquid metallic hydrogen layer, and the intense atmo­spheric pressure there crushes the dissolved gas atoms together into liquids. They quickly precipitate out. "Now, everyone has seen helium and neon burning bright colors in tubes of glass -- so-called neon lights. The friction from skydiving above Jupiter would have excited falling drop­lets of those elements in the same way, energizing them like meteors. So if big enough droplets fell far enough fast enough, someone floating right near the metallic hydrogen layer inside Jupiter maybe, just maybe, could have looked up into its cream and orange sky and seen the most spectacular light show ever -- fireworks lighting up the Jovian night with a trillion streaks of brilliant crimson, what scientists call neon rain."